As I mentioned before, I will slowly add pops of color to my wardrobe to brighten my day until Winter is over. Bright colors are just so lively that it cheers me up on a dreary day. 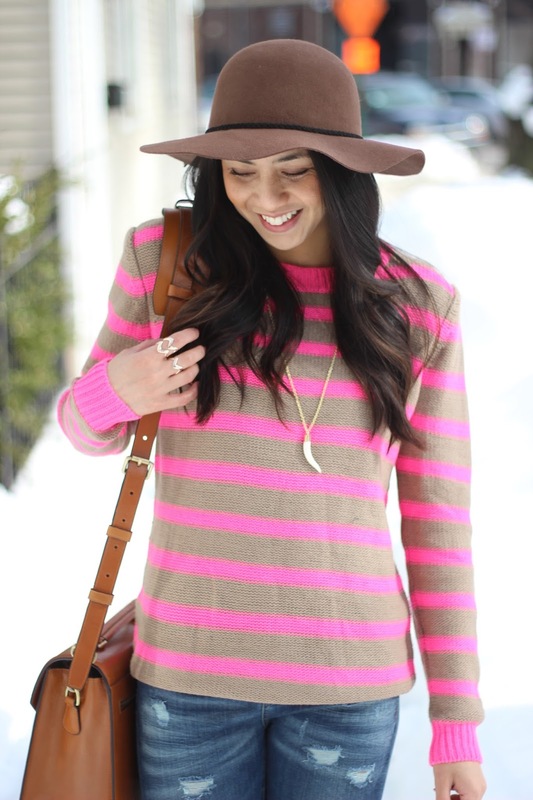 This striped sweater is a great way to be subtle with the neon pink. Pink and camel are always a great combo and it helps neutralize the bright pink. It also compliments these Urban Peach jewelry pieces. 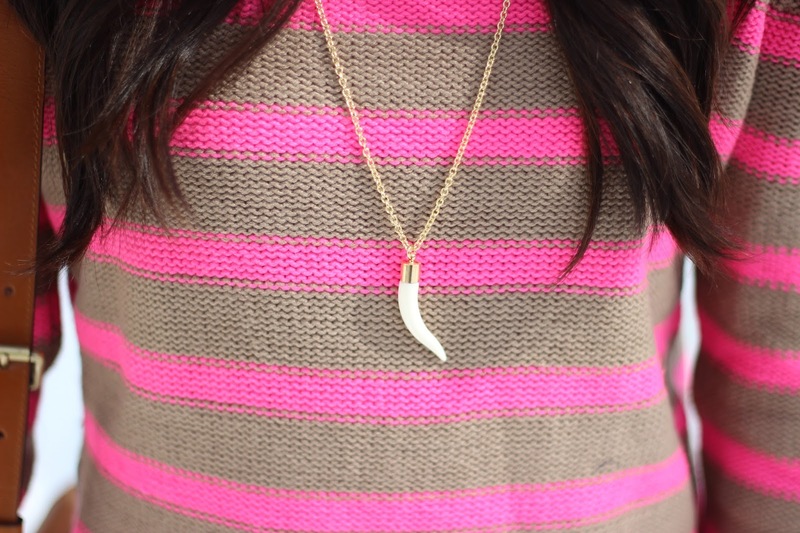 I love how the ivory tusk necklace adds a slight edge by pulling the entire outfit together. 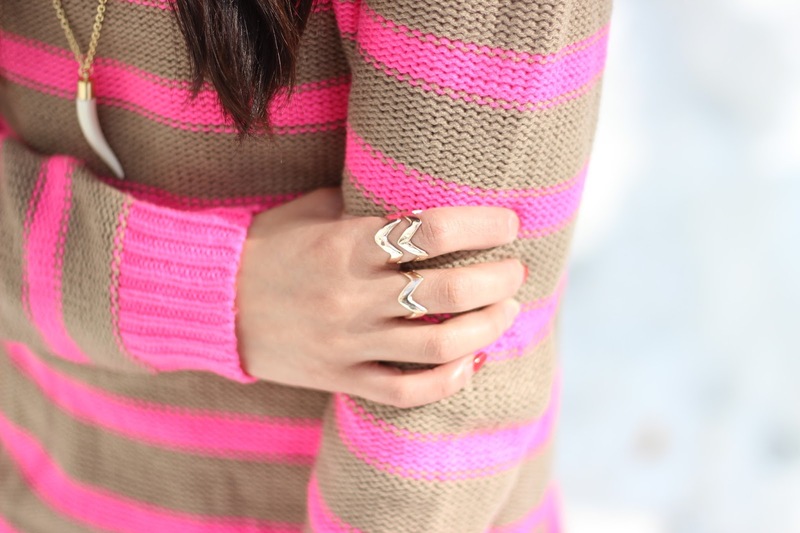 These rose gold chevron rings add a nice shine to everything. I seriously love dainty jewelry. They make a statement without looking like a statement. 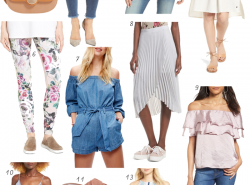 Stay tuned, I have an amazing giveaway with Urban Peach! Adorable casual look with the hint of pink! Your bag is beautiful! Love the pink and brown combo! So pretty, Rach! Oh, you know I'm loving this! Sneaking that neon pink is perfect for right now! Hot pink and camel totally compliment each other. Love that sweater and the necklace and rings are so pretty too! cute and comfy casual style! love the sweater! Cute outfit! 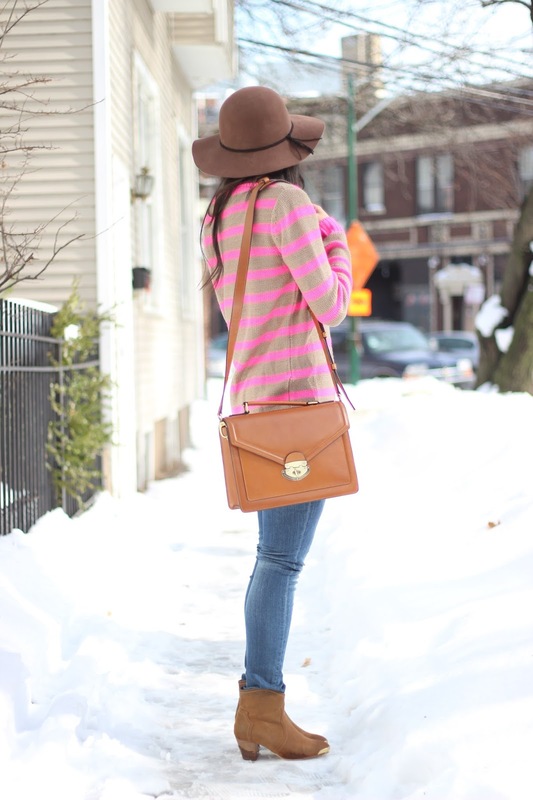 Love the pink stripes and distressed denim. Cute sweater! You really look good in pink. Thanks Arin 🙂 Thanks for stopping by! Thanks Lynne 🙂 Thanks for stopping by! Adorable look! Love the booties and sweater. I'm loving this simple and chic look, you can never go wrong with a pop of pink!! Love the colors of your sweater ! Ver pretty ! That sweater is so gorgeous,and you look great. I love the pop of pink in your effortless chic look. I loove this! The colors are great and make this dreary cold weather not seem so bad. I like that the look isn't over the top, but still makes a statement! You are rocking these cozy and casual looks this week! This one is so adorable! The top is way cute! This outfit is perfect- and some of the best floppy hat styling I've seen in a minute; gorgeous, lady! The brown & pink combination is so pretty. I especially like the hat.Definitely a cheery look. I'm dying for a hat like that but I can't pull off hats. You look marvelous! The color combination is so awesome and those rings are fantastic! Love this look and that bag is classic! Love that sweater! You look so cute! Wow, you look sooo pretty!! 😀 And what a great outfit! The combinations have been well. That sweater is SO CUTE! Adorable! Red is the kind of colours, red is the symbol of romance, power and destruction, red is the symbol of prestige. You are looking like a queen on the red.